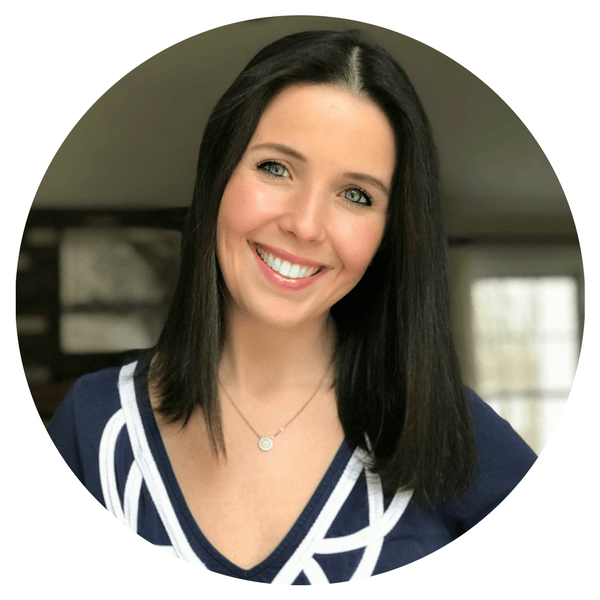 Unless you are one of the lucky few who works with your husband or gets to spend all day every day together, you likely spend hours apart many days of the week. 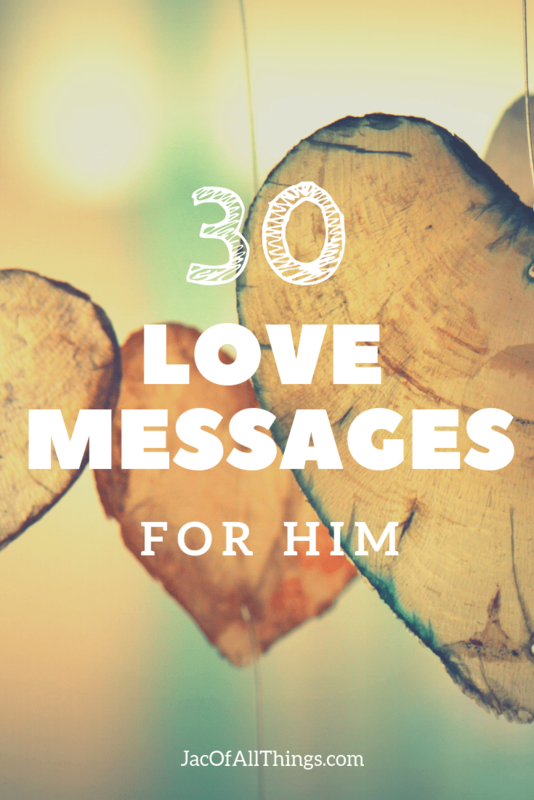 While you are apart, what better way to show your love than sending love messages to him. Depending on the day, and how prepared I am, I send love messages to him in a couple of different ways. If I am looking for a quick and easy way, I send a sweet text message to him. For days when I may have more time (or be more prepared) I like to slip little love messages in his lunchbox, his pockets, or in his car. It’s always a nice surprise and shows I really do care. You can find the cutest love notes on Amazon for cheap! These are some of my favorites. You can also purchase these cheap mirror markers to write a love message for him on your bathroom mirror to wake up to. Whatever method you choose to send love messages to him, it’s something he is going to love getting and will remind him how lucky he is to have you in his life. 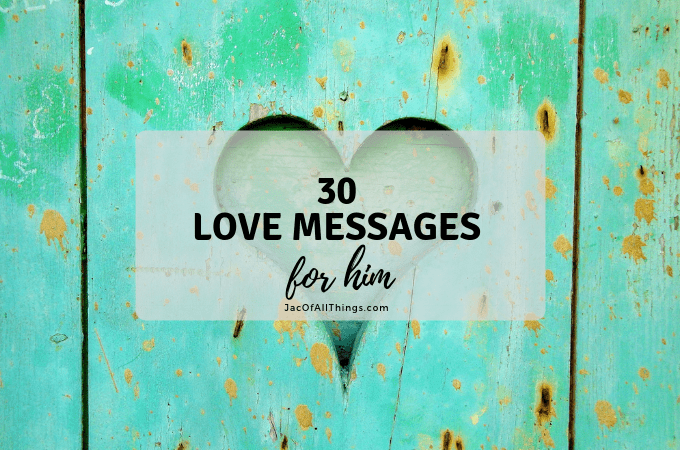 Below you will find my favorite 30 romantic love messages for him. I’m the luckiest woman in the world to have you as my husband. If we had nothing else in the world but each other, we’d still have it all. I love you more and more with each passing day. I can’t wait to snuggle up with you later. I’m still waiting to wake up from this dream. It’s hard to believe that being your wife is actually real life. I feel like the luckiest woman in the world. You are my best friend. My love. My family. Tonight is all about you. How can I make you feel special? Do you know that your are the most handsome guy in the world? You: Honeydew you know how lucky I am to be your wife? I’m listening to and just thinking about you. You: When you see me later will you pinch me? You: I want to see if being married to you is all one wonderful dream. Do you know you still give me butterflies when I see you? Tonight I’ll give you a massage. You just rest and let me take care of you. Is there anything that I can do to help you today? You do so much for me and I want to take care of you. Tell me about your dream date. I want to make it a reality. Did I tell you how hot you looked today? I am so lucky that you chose me. I’ve been smiling all day thinking of you. Do you know how happy you make me? When I was a kid, I dreamed about marrying Prince Charming. Little did I know I’d luck out even more and marry a King. I can’t remember life without you. Without us. You have filled my heart with endless love. Today I was trying to tell a story about you, but I kept getting distracted by thinking of how hot you are. Great post! I especially liked the idea to write a message on the bathroom mirror. I’m sure he will appreciate it … right after it freaks him out as it’s 4 am and on the mirror says “P.S. I love you!” with a red marker 🙂 Love it and will try it!